I'm working on putting together an inspiration board for our shop. 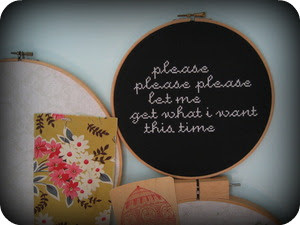 This chez-sucre-chez cross stitch has been sitting in my inspiration photo file for a long time. Not because I'm feeling like Duckie and waiting for "my time" but because it takes me back to my high school years where I was so full of optimism and inspiration. I'll be spending this weekend gathering the items I love to display on my board. I want to see them everyday; I want to soak them up. p.s. Bono Baby picked a winner. He pushed the generate button on Ramdom.org and it picked our lucky number 11. Miss Claire from Heart Homemade. We again want to thank all of you for being part of our lives. I would love to send you all a little piece of happy mail. (that is if I don't have it already).